Tom’s and Wexford played a dogged affair with Wexford doing enough to hold off a stiff Tom’s challenge. Wexford looked to be comfortably ahead at the break, but Tom’s came fighting back in the second half and made it interesting towards the end. Certainly not a classic, but with the result Wexford set themselves apart from the rest of the field. Wexford had the edge on Tom's in the first half. It was a scrappy first half. After the sides traded scores to get things going, Wexford pulled away with some effective hurling. Tom’s did have some goal-scoring chances. A penalty that was taken by Camin Morey was saved, and shortly afterwards Tom’s had another goal chance but again Wexford’s last line of defence held up. Wexford, for their part, kept the scoreboard ticking over. Joe Lyng did well at center back, and points came from Mark Molloy, Brian Dowling, Gearoid O’Connor, and John Heatherton. Tommy O’Brien and Andrew Collier pointed for Tom’s to keep them in shouting distance. Each side was fortunate not to have players dismissed following a flare up in the Tom’s goalmouth that threatened to get out of hand. Yellow cards were shown to players from each side and things settled down. The second half continued to be a disjointed affair with neither side finding any kind of rhythm or flow to their game. Tom’s wasted several scoring opportunities by either overplaying the ball or going for goal rather than the surer option. Wexford also missed several chances to extend their lead. Camin Morey pointed twice to get things going for Tom’s, while Stephen White and John Heatherton pointed for Wexford. Both sides hit several wides each before Tom’s hit with a goal. Trevor Kelly got behind the defence and his shot bounced once before hitting the back of the net. Tom’s were back in it, but Wexford did enough to hold off the challenge. Brian Dowling knocked three points over the bar as Tom’s continued to try to get the ball into Camin Morey who was well marshaled by the Wexford back line. Wexford now alone on top of the table. Tom’s: J. Grealish, E. Glynn, S. O’Brien, B. Harding, S. Higgins, P. Heneghan, T. Kelly, G. Hennelly, A. Collier, T. O’Brien, F. Keenan, S. Coen, C. Morey. 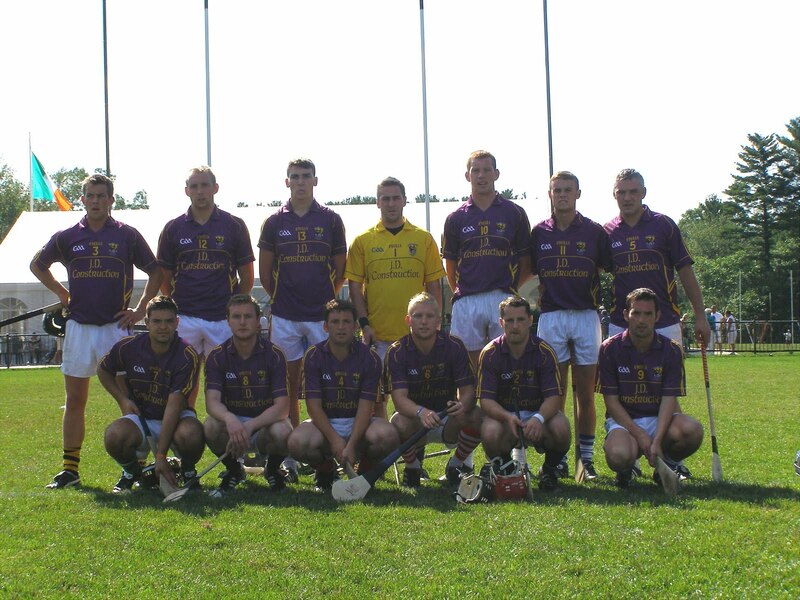 Wexford: G. Griffey, D. Redmond, G. Dunphy, B. Dalton, J. Lyng, S. White, M. Molloy, P. Dowling, G. O’Connor, A. Shore, B. Dowling, T. Murphy, J. Heatherton. Mick Sammon breaks away from his marker. The Tones had the upper hand for much for the first period and at the break held a seven point lead. With McAnespies leading by two points to one thanks to two good scores from Niall Hassey, the Tones hit with a goal from the ever dangerous Marty McGeough. The Tones then took the initiative and outplayed their opponents for the next 20 minutes. The Tones defended well and with lots of running from midfielder, John O’Keefe, opened a sizeable lead. After Mick Sammon and O’Keefe pointed, a second goal came from Joey Farrell. O’Keefe had hit the crossbar and Farrell was on hand to put the rebound in the net. More points came from Sammon and O’Keefe as the lead grew. Then we had a sending off for some boxing off the ball. Alo McGeough and Raymond Brady were both shown the line. McAnespies then came back into the game, Steven Magill pointed followed by Joe Callan and Niall Hassey. Callan ended the scoring for the half to leave it at 2-8 to 0-7 in favour of the Tones. Cliff Malone and Neil Donaghy jump for the ball. McAnespies improved their performance in the second half and enjoyed more possession than in the first. Magill and Hughes hit the mark for McAnespies, while Shane O’Brien pointed once for the Tones. The difference was two goals, and McAnespies sensed that a comeback could be on the cards. The more McAnespies pressed the more open they were at the back and the Tones took full advantage. Declan Kenihan ran the length of the field and with defenders in pursuit passed to Sammon who slid the ball beneath the keeper. Sammon himself saw red for his reaction following an incident where he protested once to often that he should have been awarded a free. McAnespies managed two points from Sean Mallon frees. The Tones worked hard in defence to keep their opponents at bay, Alan Higgins made some timely interceptions as McAnespies pushed for a much needed goal. The Tones capped of a very good performance with points from John O’Keefe and Alan Higgins to take the first of the two encounters of the day between the clubs. Macs: N. Duffy, J. Harkin, C. Treanor, A. McDonal, S. Magill (0-2), N. Hassey (0-3), E. Hughes (0-1), S. Lynn, R. Brady, N. Donaghy, S. Mallon (0-2), J. Callan (0-2), E. McCusker. Tones: K. McPartland, A. Higgins (0-1), C. O’Callaghan, A. Rooney, P. Collins, C. Malone, D. Kenihan (0-1), J. O’Keefe (1-2), A. McGeough (1-0), G. Molloy, M. McGeough, J. Farrell (1-0), M. Sammon (1-4). Sub: S. O’Brien (0-1). Wolfe Tones provided Aidan McAnespies with a stern challenge in the second encounter of the day between the teams. The game was closer than the nine points that separated the teams might indicate. The Tones hit the post, missed a penalty, and forced a couple of very good saves from McAnespies keeper, Ciaran Kendrick. McAnespies played some lovely running football at times and threatened to run away with the game in the early going, but the Tones stuck to the task and made a game of it. The Blue team from Southie will consider themselves a little unlucky not to have got something from the game. Aidan McAnespies maintained their 100% record this season. Aidan McAnespies got their running game going early in the first half. Mid-way through the game McAnespies netted a well worked goal in a move involving Mark Little and Plunkett Kane. McAnespies held the edge for most of the half and at times opened the Tones defence wide open with their incisive passing and running in supprt. Paul O”Donoghue followed the goal with another well worked score, this time a point. Plunkett Kane and O’Donoghue pointed to put McAnespies ahead by a goal and five to two points with about 15 minutes gone. With the Tones unable to effectively move the ball one began to wonder if we had a whitewash on our hands. The Tones worked their way back into the game however. Marty Farrell’s free taking was on the mark and kept the Tones in touch, while Sean Dalton and Darren Maguire also added to the Tones tally. With the Tones back in the game having pulled within four points, McAnespies hit with a second goal. Another great passing move involving Kane, Colm McCrory and finished by Sean Cournane. Each keeper was called on to earn his salt. Cathal Hynes saved well from Colm McCrory early in the first half, while close to half time it was Ciaran Kendrick who did well to stop Gary Brilly’s shot. The Tones finished the first period well, scoring three times on the trot. McAnespies led by five points at the half. Wolfe Tones worked hard but could not overcome McAnespies. The Tones pushed hard to break down McAnespies in the second half and noticeably upped their workrate. Charles McCarthy was lost to a shoulder injury and gary Brilly came into the middle of the field and made a significant contribution in his new berth. After Paul O’Donoghue restored the McAnespies lead to six points, James Doyle got his first score of the game. It was up and down the field stuff as the Tones tried to dent that lead, but McAnespies were able to keep their edge. O’Donoghue and McCrory pointed for Macs, then Farrell and Cournane swapped scores. The Tones almost had a goal but Doyle’s shot from 14 yards hit the post. The Tones managed to string three points together and get the lead down to four points but Macs did not buckle. After the lead was restored to six points, the Tones had another golden chance to cut down the deficit after a penalty was awarded when Darren Maguire was bundled down in the box. Doyle was the taker, and his shot went just wide of the post. Kendrick saved well again to deny the Tones their goal. The game was put away for good after Cournane completed his hat trick and netted a third for his team in the final minute of the game. McAnespies are a lock for the semi-final and top seed and will face the Blues in their final game of the season. The Tones meet Kerry and will need to win to ensure third place. Macs: C. Kendrick, R. McCloskey, N. Gallen, H. Gill, N. Kerr (0-1), S. Hughes, G. O’Neill, P. Kane (0-3), C. McCrory (0-2), P. Toner, M. Little, P. O’Donoghue (0-5), S. Cournane (3-1). Tones: C. Hynes, K. Regan, E. Naughton, D. Maguire (0-1), B. Kinahan, G. Brilly, C. McCarthy, L. Kavanagh, S. Dalton (0-3), J. Doyle (0-1), B. Blanchfield, D. McCabe (0-1), M. Farrell (0-6). Sub: CJ Power (0-2). Donegal and Gaels met in a game of utmost importance on Sunday afternoon, a bye for the championship semi-finals was at stake. Each side had some new faces on hand. Donegal featured Paddy Kelly and Louthman Brian White in the full forward line, while the Gaels newcomers included recentlyarrived Galwaymen, John Duane, Paul Conroy, and Danny Cummins. Donegal had the Gaels on the ropes for the first 30 minutes, but the Gaels grew in strength as the game wore on and ended up relatively comfortable winners. Donegal's Brian White attemps to burst through. Donegal enjoyed most of the possession in the first half and their tactics of hitting Paddy Kelly with the early ball worked. Kelly won plenty of frees and Brian White put them over the bar. Donegal’s veteran midfield duo of Michael McGinty and Donal McNulty won or broke enough ball to give the northerners a decided advantage in this area of the field. After the Gaels had opened brightly with two quick points, Donegal took control of affairs. The Tir Chonaill men proceeded to tally six points to one for the Gaels over the following 20 minutes. Collie Carr, White, and Paddy O’Connor all notched scores for the northerners as the Gaels struggled to win possession from their kickouts. Towards the end of the half the Gaels came back into the game. Sean Conneely, Niall Judge, Brian Carrroll, and Paul Conroy each found the mark, while Donegal tallied a point from Carr down the stretch, and the westerners drew closer by the break. Donegal led by the slimmest of margins at the half. Brian Connor rises highest for this kickout. The second half was an entirely different affair. The Gaels midfield picked it in the second and the Gaels got a major boost with a somewhat fortunate goal. It came five minutes into the second half and proved to be a sign of things to come. A Brian Connor free dropped a little short and keeper Liam Mailey batted the ball out, alert corner forward Danny Cummins was on hand to first the bouncing ball into the back of the net. The Goal gave the Gaels a three point edge now as Connor had leveled the scores with a free to get the second half going. The Gaels then combined well for Connor to put another over the bar, all with Donegal still to score in the second period. Brian White and Eoin Sheehy each pointed to make it a two point game, but the Gaels responded with with four points on the trot. Donegal began to struggle as the dominance displayed in the first half disappated. Changes were made with Kelly and White coming into the middle of the field in an effort to get back to winning some possession. John Duane showed his credentials with a point following a great run from center back. At that point the game had gone from Donegal as they trailed by six points and were struggling to turn things in their favour. The Gaels continued to get stronger into the final quarter. A flurry of points in the final minutes embellished the scoreline and the Gaels are now locked into second place and get the bye to the semi-final in four weeks time. Donegal: L. Mailey, M. Canning, N. Byrne, P. O’Connor (0-2), T. Caldwell, D. McBride, D. McNulty, M. McGinty, A. Bonner, C. Carr (0-3), E. Sheehy (0-1), P. Kelly, B. White (0-6). Sub: R. McCarthy (0-1). Gaels: B. Joyce, L. Wylie, G. Kelly, P. McNicholas, J. Duane (0-1), B. Murphy, B. Connor (0-5), P. Conroy (0-5), S. Connelly (0-1), R. Fox (0-1), B. Carroll (0-1), N. Judge (0-1), D. Cummins (1-2). Sub: J. Molloy (0-1). Mayo remained on track for a playoff berth with a win over Armagh-Notre Dame. With nothing to play for the Orchard men did not provide much resistance for Mayo in the first half, but made it interesting in the second as they came within four points at one stage. A win was a must for Mayo, and the job was not done until Danny Kirby netted with five minutes to go in the game. Mayo's Darragh McLaughlin in possession. Mayo got off to the best possible start with a Jarvey Toner goal. The goal came from Mayo’s first attack of the game. Toner followed with a point from a free, and Lewis Cawley did likewise before a second goal came from Danny Kirby. Cawley found Kirby on the run and Kirby finished well. Fintan Lilly then pointed and netted Mayo’s third goal. It was one way traffic in the early going with Mayo steamrolling through. One wondered whether Mayo would meet resistance of any sort. The northerners eventually got some traction and put some scores on the board. Paudie Finnegan got things going with a point and a goal then followed from Tom Cassidy. Finnegan almost netted a second for the Orchard county boys, but his chip from an angle went just wide. A goal at that point would have raised some concern amongst the Mayomen. Peter O’Hanlon goaled a fourth time before the whistle for the break to make it 4-6 to 1-5 at the half. Seamie O'Hare is tackled by Mike Carlon. The second half was a more competitive affair, and Armagh-Notre Dame netted a second goal from Cassidy to bring them within 5 points with fifteen minutes still to play. The Brightonians enjoyed plenty of possession. Scores came from Finnegan and John Comiskey. Mayo had to buckle down now to ensure that a comeback was not going to happen, and work hard they did. Finishing was not the forte of the westerners as they lost their way a little in the second half. While they kept their opponents at bay, mayo did not make the most of the chances that they had to put the nail in the coffin. The northerners then drew within four points after Paudie Finnegan pointed twice and Mayo nerves were on edge as the once comfortable lead was in danger of evaporating. The tension was relieved somewhat after Danny Kirby netted Mayo’s fifth goal. Toner waited for the opportunity to find the right pass and Kirby came though to finish from close range with minutes on the clock. Jack McDonnell put the finishing touches on the win with a point and the westerners breathed at least a small sigh of relief. Mayo: A. Townsend, S. Clifford, B. McShea, P. O’Donoghue, K. Comer, M. Carlon, D. Kirby (2-0), P. Dooney, P. O’Hanlon (1-0), F. Lilly (1-2), G. Toner (1-2), D. McLaughlin, L. Cawley (0-2). Sub: J. McDonnell (0-2). Armagh-ND: D. Fields, O. Costello, D. Culleton, S. McKenna, F. Meehan, M. McAuley, K. Lynch, J. Lavery, T. Cassidy (2-0), J. Comiskey (0-1), G. Hall, S. O’Hare, P. Finnegan (0-7). The results this weekend put the Gaels and McAnespies in the semi-finals. Unless there is a major upset on the final weekend of the regular season this coming weekend, it seems like the big game will be Mayo and Christopher's at 1:15 next Sunday. Wexford are now firmly on top of the table having beaten Tom's, but will face a tough game against ﻿a Galway team desperate for a win next Sunday. 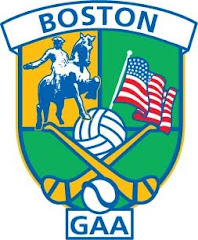 Listen to Denis O'Briens Podcast for an update on the Boston GAA Championships. Kerry and Mayo, two of the high flying junior B teams met on the main field on a hot Sunday afternoon. Having looked dead and buried at the end of the first half, Mayo came back to win at the very end. It was all Kerry in the first half and Mayo had a 13-point mountain to climb at the break. Climb it they did as Mayo stormed back in the second half, and Gervais Toner won the game for Mayo with a point from a free that proved to be the last kick of the game. Philip Sullivan on the run for Kerry. Kerry had the advantage for the first 30 minutes and held a ten point advantage at the end of one. The Kerry forward line was too fast and fit for the Mayo defenders. Chris Cullinan, Fran Keenan, and James Dooley caused numerous problems for the Mayo back line. Playing at center forward, Keenan bagged two goals in the first period, while points came from Curran, Chris Cullinan, and Paudi Murphy. Kerry’s half back line also found room to move forward, creating many situations where the extra man was helping out on the attack. Mayo created some chances, and managed a score from Conor Walsh. Too often however, the final pass was wayward or the man in possession was swarmed with defenders. On occasion the Mayo forwards felt they had cause to question why a fee was not awarded, frustration may also have had something to do with it. Mayo did much better in the second half and Dan O’Connor was called upon to pull off some improbable saves. Mayo were much more to the fore and Gervais Toner found himself through on a couple of occasions. O’Connor managed to stick a boot out to save the first chance and the ball came back out off the inside of the post. Toner had to settle for a point on the second occasion after O’Connor saved the first effort. Conor Walsh and Joe Morinn pointed for Mayo to narrow the gap. Morinn came up from corner back to take a penalty and ended up putting the ball over the bar. Two goals came for Mayo as the westerners kept up the intensity level and Kerry tired. One came from a quick free taken by Andy Coyne after the same player was fouled inside the 21. The second was as a result of a penalty taken by Toner after Kevin Walsh was bundled over in the area. Three more points came from Liam Holt, a Toner free, and Brian McStay and the distance between the sides narrowed to three points with five minutes to go. Kerry had a couple of chances to put away an insurance score but failed to do so and paid for it in the final minute of the half. Mayo surged forward for one last attack and Toner found a wide open Conor Walsh who only had to put the ball into the empty net. As the Mayo back line continued to work hard to keep Kerry from scoring, a chance to win the game presented itself after Mayo won a free 30 yards from goal. Toner stepped up and slotted the dead ball over the bar to the delight of Mayo fans. Mayo: F. Ryan, M. Carling, J. Morinn, S. McDonagh, D. Quinn, K. Harrington, G. Toner, L. Holt, A. Coyne, K. Walsh, B. McStay, K. Walsh, C. Walsh. Kerry: D. O’Connor, J. Green, M. Markhan, A. Curran, P. Murphy, C. McGillicuddy, M. Taylor, A. Collier, J. Dooley, F. Keenan, P. Sullivan, C. Cullinan, J. Cuddy. Galway were in a “must win” situation in the first of their 3 second round games of the senior hurling championship. The tribesmen played that way for most of the game and were good for the win only to see it slip away in the final seconds of the game. Tipperary’s back line buckled down and pushed hard in the second half and had Galway on the ropes. The breakthrough came at the very end in very unusual fashion, and the teams had to settle for the draw which was much more to the disappointment of Galway. Tipp's PaddyFanning breaks through Galway's defence. Galway played with the type of urgency the situation demanded in the first half and stamped their authority on the game early. The addition of Fintan O’Leary to the fold bolstered the forward line, and O’Leary tallied a goal and two points in the first 30 minutes. After Paul McGrath opened the scoring for Tipp with a point, Galway opened theirs with a goal. Eoin Guinan buried a 21 yard free high into the roof of the net and Galway made their statement of intent. Guinan followed with a 65 and after putting another point over, O’Leary got in on the act with a point. O’Leary followed with a goal, fetching the ball over his marker and turned with the keeper to beat. Keith Killilea and Noel McCree also kept the scoreboard ticking over for Galway, McCree from County Down putting a tremendous effort over the bar late in the half and it looked as if this could be Galway’s day. Tipp got into the game later in the half. Mark Flaherty capitalized with some well taken frees and at the break it was 2-8 to 0-8 in favour of Galway. Mark Flaherty shoots for goal. Galway continued to hurl well from the back after the restart, Sylvie Og Linnane and Andrew Brennan did well in the half back line, but in the early going Galway hit several wides, scores that had they gone over would have had Tipperary on the brink of defeat. The Tipp back line buckled down however, and O’Leary had a frustrating second half. John Kindregan and Brian Howley won nearly every ball that came in their direction and Tipp built on that with some scores and reined in the Galway lead. Darragh O’Connell and Odhran Kealy, both of whom entered as subs, pointed twice each to make it a two point game. Galway managed to keep in front with points from Paul Guinan, Keith Killilea, and Eoin Guinan, but with time running out and Tipp holding the upper hand it was backs to the wall for the tribesmen and the defending took on an increasing air of deaparation. The drama was yet to come, the teams swapped two points each and Galway held a one goal lead. In a bizarre sequence, Tipp hit the crossbar, forced a save from the keeper, a clearance off the line and just when it appeared that Galway had won the ball and would finally clear, the ball ended up in the back of the net as the defender tried to clear while on the ground. Game now tied. Each side had a chance to put the winning point over the bar, but both missed. The draw keeps Galway in with a slim chance, though a win is an absolute must in their next outing. Galway: K. Finnegan, K. Murphy, M. Malone, S. Linnane, A. Brennan, E. Mahoney, J. Moylan, N. McCree, E. Guinan, C. Woods, P. Guinan, K. Killelea, F. O’Leary. Tipp: S. Delaney, J. Roche, J. Kindregan, I. Duggan, C. Leahy, B. Howley, J. Fitzpatrick, E. Hayes, P. Fanning, M. Flaherty, P. McGrath, S. Lambert, W. Walsh. Kerry and Armagh-Notre Dame met in a lower end of the table battle Sunday afternoon. Kerry just about held on in the second half after establishing a six-point first half lead. The Brighton side got within three points in the second half, but the game broke down into a disjointed second half with several scuffles breaking out and Kerry went on the win by a one goal margin. Kerry's Padraig Doyle wins this midfield battle. The first half was mostly Kerry. Kerry had the upper hand for the first 20 minutes by the end of which the Kingdom held a 1-6 to 0-1 lead. The northerners were not in it. Stephen O’Brien was on form in the corner and popped over the first two points. Padraig Doyle added a third before the Orchard County men opened their account with a Paudie Finnegan point. The usually dangerous Finnegan had a quiet first half. Kerry continued their dominance with the return of Sean Fogerty in the middle of the field, who though clearly hobbled by injury strengthened his side’s cause. Ian Galvin netted after about 20 minutes of the half gone, but the Brighton side finished the half strong with a flurry of late scores to keep themselves in the game. Seamie O’Hare and Paudie Finnegan narrowed the deficit to six points at the break, 1-7 to 0-4 in favour of the Kingdom. Gavin Hall in possession for Armagh-Notre Dame. The second half proved to be a testy affair. Two players were shown red cards. Ian Whelan for Kerry and Andy Murnin for Armagh-Notre Dame were shown the line following a breakout of fisticuffs involving several players from each side. The Orchard men had worked themselves back into the game early in the half with points from Finnegan and O’Hare. Kieran Moore stemmed the tide with a point for Kerry, scoring their only point of the second period, and then the scuffles broke out. The game never got into a rythm and it was a dig it out affair. Finnegan pointed late in the game, which meant that a goal would tie it, but there was too little time left to try to go for one. Kerry escape with the win, though in rather unconvincing fashion. Kerry: P. Bailey, M. Griffin, D. O’Sullivan, M. Godley, T. Dennehy, M. Fallon, S. Fogerty, T. Doyle, P. Doyle (0-1), I. Whelan, K. Moore (0-1), S. O’Brien (0-3), I. Galvin (1-3). Armagh-ND: D. Fields, O. Costello, D. Culleton, M. McAuley, F. Meehan, G. Cairns, A. Murnin, J. Lavery, J. Comiskey, M.Tiffany, G. Hall, S. O’Hare (0-2), P. Finnegan (0-6). The Gaels and Mayo ground it out over 60 minutes in the heat of Canton with the Gaels just about making it over the finish line. The Gaels always had a slight upper hand but almost let it slip at the end. A late goal from Mayo had the Gaels in the precarious position of playing out the final whistle in injury time while holding a one-point lead. Mayo had the Gaels nerves on edge for the last few minutes but came out on the losing end on Sunday. Mayo were on the attack right away and had an early chance of a goal shortly after the throw-in, however twice in the same sequence the ball hit the crossbar. Both sides kicked some early wides, though the Gaels were the guiltier party with three poor efforts in a row. Mayo got on the board first with a Fintan Kelly point, and again almost goaled after Danny Kirby was found with a great cross-field ball, but Liam Wylie blocked the shot well. Pete Dooney made it a two point Mayo lead, and then the Gaels came into the game. Barry Murphy who returned from injury and Brian Connor combined well in midfield. Robbie Fox got the Gaels off the mark following a good move involving Connor and Murphy, and Connor pointed twice from frees and once from play. Play slowed in the heat as the half wore on and players tired. Ray Geraghty and Connor traded points to end the half with the Gaels leading by five points to three. The Gaels made a change and brought in John Molloy to start the second half, a change that worked well as the Westmeath native helped himself to four points, one a free from 45 yards. Mayo made some changes themselves, bringing Pete Dooney into the middle of the field. Jack McDonnell pointed beautifully for Mayo to get things going in the second half, and the sides were on level terms at one point after Ray Geraghty put back to back points together. Very much game on. The Gaels asserted themselves on the game and proceeded to open a lead however. Pat McNicholas won several good balls in the half back line and Brian Carroll also worked hard in the trenches for the Gaels. Points came from Molloy, Toner, and Brian Carroll and late in the game the Gaels led by four points and looked to have done enough. The Connemara men were somewhat wasteful with chances to clinch the win late in the game and Mayo almost made them pay. Dooney was found all alone on the wing and ran untouched 30 yards to the 21 and let fly into the far corner of the net. Now the Gaels held a shaky one point lead with time left to play. The Gaels managed to play out the clock in a nervous finish and sit in second place in the table with only the Wolfe Tones and Donegal able to catch them. Gaels: G. Joyce, L. Wylie, G. Kelly, P. McNicholas, P. Devine, B. Carroll (0-1), B. Murphy, B. Connor (0-4), S. Connelly, B. Toner (0-1), R. Fox (0-1), S. Monaghan, N. Judge. Mayo: A. Townsend, S. Clifford, B. McShea, P. O’Donohue, K. Comer, F. Kelly (0-1), D. Kirby, R. Geraghty (0-4), M. Butterfield, P. O’Hanlon, P. Dooney (1-2), J. McDonnell, D. McLoughlin. Sub: J. Molloy (0-4). Galway secured an all important win over Christopher’s and appeared to have their opponents where they wanted them for most of the second half of this game. However, two quick goals from Christopher’s late in the game almost saw them steal it only for Galway to come back at the very end with points from Anton McFadden and David Kelly to secure the points and stay on the playoff trail. Colm O'Driscoll on the ball for Christopher's. Galway had the upper hand in the first half. The tribesmen had the Christopher’s back line under pressure for most of the opening period. A goal from Shane Beston kept Christopher’s in the game. Apart from that hiccup Galway enjoyed the lions share of possession. Galway enjoyed most of the possession and with Gearoid O’Connor back in the forward line, the Galwaymen played some good passing football. Galway pointed through James Carroll, Dave Kelly and Kevin Cummins as the westerners kept up the pressure for the opening period. Christopher’s found occasional relief, and managed to keep in touch with scores from Eric Hegarty frees but Hegarty and fellow corner forward, Shane Beston were sitting idle in the full forward line for most of the half. Galway led by three at the break. Galway corner back Ger Dunphy. Galway mopped up well at the back for much of the second half and Christopher’s forwards had to try to make the most of the scraps that came their way. Galway’s Kevin Cummins put the first three points of the second half over the bar, and was followed by one from Kelly and another from Carroll. With the Galway back line looking well able for anything Christopher’s could throw at them it looked like curtains for the Hyde Park men early in the half. Things were about to change however, and not without a stroke of good fortune. Christopher’s pegged back two points, which were followed by a goal that was unusual in it’s occurrence. A free appeared to have been awarded but the ball ended up in the back of the net with no apparent free taken, and the goal stood. Soon afterwards a second and equalizing goal came from Christopher’s. Colm O’Driscoll streaked between two defenders and finished from a tight angle. Galway were stunned having led so comfortably a few minutes beforehand. Eric Hegarty then put Christopher’s ahead with a free and the game was stunningly turned on it’s head. There was time left for Galway to pull it out however, and the westerners did just that. Galway regained the upper hand in the final 5 minutes and Anton McFadden leveled the scores running through from center back, and the winner came from Sligoman, David Kelly. Galway still in with a shout for the quarter finals. The senior football season is shaping up to be one where Aidan McAnespies look like locking up one of the two semi-final places. Second place is wide open with the Connemara Gaels, Wolfe Tones, Donegal, and Christopher’s having a chance of avoiding a quarter final. With one less game played, the Tones probably have the best chance of making the number two spot at the end of the season. The Tones play Cork on Saturday at 5:00. Cork have been competitive this season, but have just not had enough to better the teams they have faced this season. The Tones are looking strong this year and should take the points against the rebels. Solid in midfield and with a talented forward line for Cork to deal with the Tones could well be sitting in second place with 9 points on Saturday evening. There are some important games Sunday. 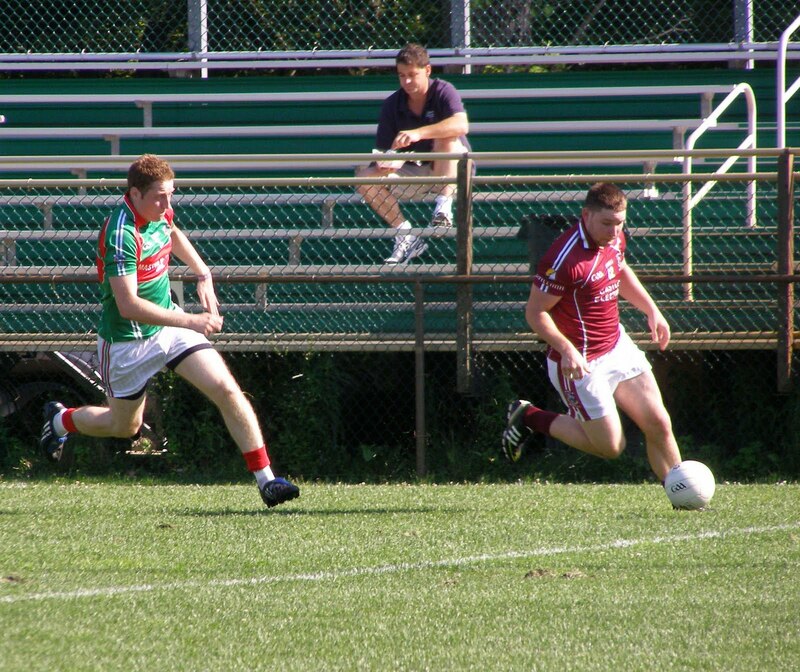 The Gaels and Mayo clash at 2:30 and Christopher’s and Galway meet at 5:00. Mayo are sitting just outside the top 6 and need to win to keep in the hunt for a quarter-final place. The Gaels are hoping that a win would keep them in second place – albeit with one more game played than the Tones. A hard game to call given that Mayo have put in some excellent performances this year, and the Gaels have done likewise. If the Gaels can maintain concentration for the hour I’d expect a win for the Connemara men. It is a similar situation with Christopher’s and Galway. Galway need to win to keep in with a top 6 chance, and Christopher’s have an outside shot at second. Again, a hard game to call. Galway have a well balanced team with some excellent forwards. Christopher’s are very strong in areas, notably up front with Kevin and Colm O’Driscoll and Shane Beston terrorizing defences. Should be a close game, though I might give the nod to Galway. Andrew Shore could give them an edge in midfield, while scores could come from any of the five forwards – Kevin Cummins, James Carroll, Jamie Keogh, Danny Reddin, and possibly a returning Gearoid O’Connor the Galway front 5 will be hard to hold. Armagh-Notre Dame and Kerry meet at 1:15 in a game that could go either way. Each team could make the intermediate final which will be played between the 7th and 8th placed teams. The second half of the senior hurling championship begins with an exciting senior hurling game on the cards at 3:45. Galway take on Tipperary. Galway desperately need the win to stay in with a chance of making the playoffs next month. Galway were pipped last week by Fr. Tom Burke’s so the tribesmen are close to getting that first championship win. The forward line will need to turn it up a notch to turn Tipp. Tipperary’s only win so far is against their opponents on Sunday, Galway will be doing their best to make sure it is not 2 for 2.
as they wrapped up the Ladies Senior Football Championship. Tir na nOg wrapped up the Ladies Senior Football Championship with little fuss on Sunday. The champions hit the back of the net three times before the mid-point of the first half. Points flew over the bar from all angles. Try as they might, the Shamrocks were unable to make an impression on their opponents and the celebrations began early before heading back to Brighton for the evening. Tir na nOg opened with a goal from Natalia Hyland, the tall center forward made and early statement of intent with the goal as she tormented the Shamrocks defence for the rest of the half. Hannah Noonan followed with a point, and the Shamrocks then pointed to make get themselves on the board. Tir na nOg took off from there. A plethora of scores over the ensuing 20 minutes signaled that the senior football championship would be destined to return to Tir na nOg. Paula McGrath and Katie Murphy each netted before half time. Tir na nOg were stronger in almost all areas of the field. Shamrocks keeper, Doreen O’Connor, had a busy afternoon and pulled off some excellent saves. The Tir na nOg half back line got in on the act with scores coming from Mairead Luttrel and Norah Kirby each stole forward for points. The one bright spot for the Shamrocks was a goal that came from Shannon Loughran following a pass from Sharon McGovern. At the half it was 1-2 to 4-9 for the champions. The Shamrocks scored first in the second half from Trish Hasset, but then their opponents turned it on again. The gap between the sides continued to grow, Niamh McEvoy, Paula McGrath, substitute Eimear Gallagher, and Sinead Bannon pointed. The Shamrocks generated several good scoring chances in the second half, but did not meet with success converting. Center forward Karen Keenie gave the Shamrocks some reason to cheer with a goal towards the end of the half, but by that stage the Ladies in green were playing for pride. Where once Ladies Football in Boston more or less meant the Boston Shamrocks, the pendulum has swung and now it is Tir na nOg who are firm kingpins in the Northeast. 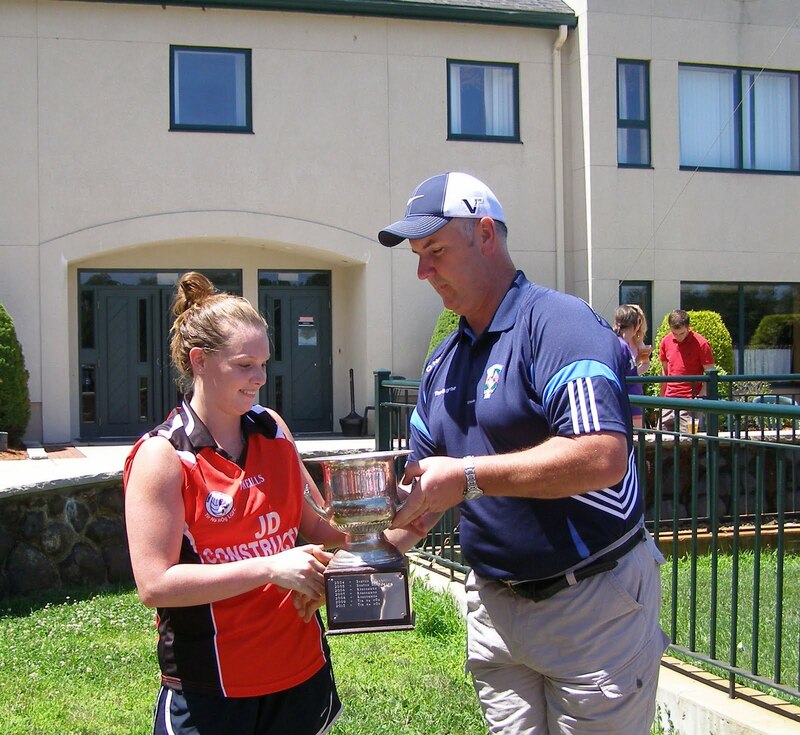 The sides will meet again in the Orla Benson Cup Final at the end of August. Next up for the Ladies is the 7-a-side on Saturday afternoon. The Brighton girls will represent the North East Board at the NACB Finals on Labor Day weekend and best of luck! Shamrocks: D. O’Connor, K. Moore, C. McGinley, J. O’Connell, J. McNulty, G. Byrne, E. Brick, E. Sherwood, S. MacKessey, D. Ward, K. Keenie, T. Hassett, S. Loughran, A McDonnell, S. McGovern. Tir na nOg: L. Brick, T. Moran, N. Keane, H. Murray, M. Luttrell, N. Kirby, S. Delahunty, H. Noonan, N. McEvoy, K. Murphy, N. Hyland, P. McGrath, C. McConnell, J. Murphy, S. Bannon. With the first half of the senior hurling championship played, Wexford have established themselves as the team to beat with a win over Tipperary. Wexford opened an eight point lead in the first half, but Tipp pulled it back to less than a score late in the second only for Wexford to finish the game with three points on the trot. Wexford scored an impressive win over Tipperary on Sunday. Wexford took the break with an eight point lead. Playing at center forward, Andrew Shore played a big part in Wexford’s advantage while Tony Murphy and Cathal Kenny put some tidy scores over the bar. Tipp hung with Wexford for most of the half, but then came the goals, two in the final five minutes. Both came from the stick of Tony Murphy. The first came after Murphy was played through by Brian Dowling and Murphy put the ball into the far corner. Murphy was through in an almost identical situation a few minutes beforehand, and Sean Delaney saved well on the near post. The second came from a 21-yard free. Murphy stepped up and powered a rocket into the back of the net. The second goal made it 2-9 to 0-7 with the half time whistle approaching. Paddy Fanning and Peter Dowling swapped scores to end the half. 2-10 to 0-8 for Wexford after 30 minutes. Tipp came close but fell just short of a great comeback in the second half. Tipp staged somewhat of a comeback in the second half and reined in the lead. The half opened with the sides matching each other for a goal and two points. Tipp hit first with a goal from Stephen Lambert, but Wexford got it right back less then a minute later after Brian Dowling was played through excellently. The final 15 minutes saw Tipp eat into the Wexford lead. Tipp managed to gain the upper hand for a period and scored seven points to Wexford’s one to narrow the gap to 2 points. Darragh O’Connell was on the mark with frees while substitutes Odhran Kealy and Ian Duggan Tipp now had the advantage in the back line as Wexford’s foray’s forward ended up coming right back downfield. Odhran Kealy put a rousing point over the bar and with Wexford on the ropes what a few minutes beforehand looked like a win was in serious jeopardy. A goal would now win it for Tipp, but with extreme anxiety creeping into the Wexford ranks Tony Murphy came to the rescue with a point and set up Brian Dowling with a score to restore the lead to four points. Wexford now join Tom’s atop the table and look like they will be hard to beat. Wexford: G. Griffey, D. Redmond, G. Dunphy, B. Dalton, D. Magill, S. White, P. Dowling (0-1), M. Molloy (0-1), B. Dowling (1-2), A. Shore (0-3), C. Kenny (0-2), T. Murphy (2-4), J. Hetherington (0-2). Tipp: S. Delaney, J. Kindregan, B. Flaherty, A. McRedmond, C. Leahy, B. Howley, E. Hayes (0-1), J. Fitzpatrick, W. Walsh (0-2), P. Fanning (0-2), P. McGrath, S. Lambert (1-1), D. O’Connell (0-7). Subs: J. Roach (0-1), Odhran Kealy (0-1), I. Duggan (0-2). In Saturday’s senior hurling match between Fr. Tom Burke’s and Galway, Tom’s prevailed by a single point in what was a cracking game. The final score was 2-15 to 0-20 for Tom’s. The result gives Tom’s 5 points and sitting joint top of the table with Wexford, and leaves Galway still looking for a win with the first half of the championship completed. Aidan McAnespies have beaten all comers so far this season and Sunday it was no different against Donegal. McAnespies were quicker, sharper, and displayed a high level of teamwork and understanding to leave last years Boston champions far behind in the rearview mirror. Gary O'Neill rises highest for the kickout. McAnespies tallied eleven scores in the first half, two of them goals. Donegal were unable to keep up with their opponents as McAnespies swept down the field in waves while it seemed as if Donegal were swimming against the tide. The McAnespies back line was quick to close down any threat from Donegal, and what openings Donegal got usually ended up with the ball dropping short into the keeper’s hands. McAnespies inter-passing was impressive, sharp and quick. The first score for McAnespies was a goal from a Paul O’Donoghue penalty. Mark Little was brought down in the area and O’Donoghue placed the ball into the corner with little fuss. Eight points were scored before Donegal registered their third point. Collie Carr and Jamie Doherty accounted for the first two for the northerners. O’Donoghue put back to back 45s over the bar, while Plunkett Donaghy, Rory Bracken and Mark Little also scored. Donegal corner back Niall Byrne did well, but there was little for Donegal supporters to cheer. Colm McCrory started the move that led to the second goal being put away by Sean Cournane. It did not look good from a Donegal perspective coming into the second half. The second half was more or less the same story. McAnespies backs quick to any ball played into the Donegal forward line, and the forwards had Donegal chasing shadows. Donegal did get a consolation goal from Collie Carr. McAnespies piled it on with points from Kane, Little, Philip Toner and O’Donoghue. A late goal from Colm McCrory was salt in the wound for Donegal, while substitute Steven Magill added a couple more. McAnespies looking like they are destined to repeat as champions as the distance between them and the rest of the field grows. Macs: C. Kendrick, R. McCloskey, N. Gallen, C. McCrory, N. Kerr, S. Hughes, G. O’Neill, R. Bracken, P. Kane, P. Toner, M. Little, P. O’Donoghue, S. Cournane. Donegal: L. Mailey, N. Byrne, M. Canning, P. O’Connell, T. Caldwell, D. McBride, M. McGinty, E. Doonan, C. Carr, B. White, A. Bonner, J. Doherty, P. Kelly. Christopher’s secured a very important win over a disappointing Shannon Blues Sunday afternoon. A goal in each half put Christopher’s in the drivers seat while for the second week in a row the Blues could not lift their game when it mattered. Christopher’s cruised in the second half as the lead stretched beyond the reach of the Blues..
Aidan Walsh is pursued by Kieran Hurley. The first half was evenly contested. Neither side could find an advantage, though had the Blues taken their chances they could have been looking at a tie by half time rather than a one goal deficit. Shane Cahill opened affairs with a point for the Blues, which was answered with one from John Moylan. Gary Kissane saved well from Shane Beston as the speedy corner forward broke free to shoot on goal, it was a sign of things to come however. A goal came shortly afterwards from Beston who was found by Dan Kenneally running through. Beston sidestepped the keeper and finished into the top corner. Beston was in fine form and when on the ball looked dangerous. The Blues came back with two points, both from Kieran Hurley – one free and one from play. The Blues then proceeded to waste some chances, kicking some decent scoring opportunities wide. Christopher’s finished the half with two Eric Hegarty frees to take the break a goal to the good, 1-3 to 0-3. Shane Beston was in great form for Christopher's. Christopher’s ran away with the game in the second half. Some sound play in the back line and some well worked passing moves was the key to victory. Many of these were capped by great finishes from Beston who kicked at least two wonderful scores. Midway through the half Christopher’s scored their second goal. This time it was Eric Hegarty who finished in similar fashion to Beston in the first. The goal seemed to knock the spirit out of the Blues and they had the look of a beaten team for the last 20 minutes. Christopher’s continued to press home their advantage. O’Driscoll at center forward, Beston at corner forward, and John Moylan put in fine performances as the game got beyond the Blues. The Blues mamaged a consolation goal in injury time by Pat Murray. Christopher’s on track for the playoff and the Blues season looks like it is slipping away. Blues: G. Kissane, S. Kelly, S. Mann, P. Magee (0-2), B. Shanahan, C. Mullen, P. Murray (1-0), S. Cahill (0-1), D. McElligott, M. Lyons, K. O’Shea, K. Hurley (0-2), S. Carroll. Christopher’s: S. Kelly, N. Ryan, E. O’Neill, K. O’Driscoll, A. Greaney, P. Kenneally, D. Kenneally, A. Walsh, J. Moylan (0-2), C. O’Driscoll (0-1), P. Delaney, S. Beston (1-3), E. Hegarty (1-4). Kerry and the Gaels played a supremely exciting game Sunday afternoon. Three first half goals from Kerry had the Gaels on the ropes for much of the game but the Connemara men got it together to come back late in the first half, and again in the second after falling behind early after the restart to have a chance to win with the final kick of the game. Unfortunately for the Gaels, and to the relief of Kerry, the kick hit the post and the sides had to settle for a draw. The Gael's Brian Connor on the move. The Gaels opened the game with a flurry of points, Steve Monaghan, Tom McDonagh, Brian Carroll, and Brian Connor had the Gaels leading four points to no score after 10 minutes. Kerry settled into the game however, and after Stephen O’Brien and Peter Curry pointed, the Kingdom took advantage of a napping Gaels back line. O’Brien won a free and quickly took it to an unmarked Ian Whelan who blasted his shot into the far corner from inside the 14 yard line. Two more goals followed for Kerry, and O’Brien played a part in both. O’Brien himself put the second Kerry goal away after a ball over the top caught out the Gaels defence a second time. For the third goal O’Brien rounded his man and again passed to Whelan who palmed the ball into the back of the net. Kerry’s lead was six points. The stunned Gaels gathered themselves and mounted a comeback. Brian Connor was instrumental in the resurgence. A pointed 45 followed by a trademark goal from Connor brought the Gaels within two points. After Connor reduced the deficit to a point, Tom McDonagh restored the Gaels to level terms with their opponents with a well taken point. Kerry took the break ahead by one with another point from O’Brien. At the half it was 1-8 to 3-3 in Kerry’s favour. Steve Monaghan on the ball. Kerry opened the second half with a flourish. Three unanswered points from Doyle, Tom Dennehy, and O’Brien extended the lead to four. With 20 minutes left to play the Gaels lost Tommy Walsh to a sending off for dissent, however the westerners started to get their running game together. Fresh legs entered the fray in the form of several substitutions, and Brian Toner worked hard at center forward. Points came from Connor, Toner, and Gordon Kelly. Kerry leveled the scores through substitute Ian Galvin. Time was of the essence at this stage and each side had a chance to win it before the final whistle. With the game in injury time Ian Galvin beat the cover and motored towards goal, but his shot was blocked superbly by Sean Manley. A minute later it was the Gaels turn to try and secure the points with a free from about 30 yards out near the stand sideline. Brian Connor’s curling shot looked to be heading over the bar but hit the inside and went back into play. The final whistle sounded and the points were split. Kerry: P. Bailey, M. Griffin, D. O’Sullivan, M. Godley, T. Dennehy (0-1), K. Moore, P. Curry (0-1), T. Doyle, P. Doyle (0-1), I. Whelan (2-0), M. Fallon, S. O’Brien (1-3), G. Cummings. Sub: I. Galvin (0-1). Gaels: G. Joyce, L. Wylie, S. Manley, P. McNicholas, T. Walsh, B. Carroll (0-1), G. Kelly, B. Connor (1-6), S. Connelly, B. Toner (0-2), T. McDonagh (0-2), S. Monaghan (0-1), N. Judge. Sub: G. Kelly (0-1). Galway prevailed in this battle of the western counties thanks to a 15 minute second half flourish where the tribesmen capitalized on their wealth of possession and put five unanswered points over the bar. The first half was keenly contested, however in the second period Mayo lost their way while Galway’s corner forward, James Carroll, helped himself to five points as Galway cruised to an all important victory. Galway opened the game with the best possible start. Carroll goaled within the first 2 minutes, it was a warning sign of what to expect from him. Mayo kept their composure and proceeded to whittle away at the deficit with points. Fintan Kelly put a lovely curling effort over the bar and was followed by Ray Geraghty shortly afterwards. With neither midfield enjoying a decided advantage possession was evenly shared between the teams. Galway moved the ball well, but the Mayo back line were quick to close down the spaces. Galway however possess two dangerous corner forwards, and Carroll broke free on a couple of occasions and tallied two more points. One could have been a goal, but with the keeper to beat the Donegal man’s shot was low, but not low enough and went over the bar. A goal at that stage would surely have instilled some doubt into Mayo minds as the Galway lead was now two points instead of a possible four. Dara McLaughlin and Aidan Walsh had pointed for Mayo, and before half time a pointed free from Walsh made six scores for Mayo to five for Galway, but the early goal meant Galway led by a point. Barry McShea chases Kevin Cummins. The second half got underway with a wide for Mayo. Galway were enjoying most of the possession, but proceeded to kick 4 wides before Carroll put a free over from around 45 meters. Mayo made some substitutions to try and swing the game in their favour. Gervase Toner and Lewis Cawley were introduced to the fray. Galway’s supremacy continued however. Having missed the early efforts, now Galway could not miss. Carroll pointed three more times, one free, and Danny Reddin also added to the Galway lead with a point. Mayo’s play became disjointed and confidence seemed to drop. Eoghan Kavanagh led the effort from the middle of the field for Galway and play was mostly in one direction. Kevin Cummins almost goaled for Galway, but his close range effort was blocked on the line. With 10 minutes to go Galway were sitting on a comfortable six point lead. Mayo tried to raise their efforts but attacks broke down before the ball reached the danger area. Mayo’s first score of the second half came from Aidan Walsh with 28 minutes gone. Another followed from a free to reduce the deficit to four points but Galway’s Carroll capped a fine performance with his ninth score of the day. An important win for Galway, while Mayo’s hopes for the playoffs took a blow with three games left to play. Galway: P. McComiskey, D. Walsh, G. Dunphy, P. Cummins, E. Doherty, A. McFadden, A. Shore, E. Kavanagh, D. Reddin (0-1), P. Nolan, J. Keogh, K. Cummins (0-1), J. Carroll (1-9). Mayo: A. Townsend, S. Clifford, B. McShea, P. O’Donoghue, K. Comer, D. Dolan, D. Kirby, F. Kelly (0-1), M. Butterfield, A. Walsh (0-5), R. Geraghty (0-1), J. McDonnell, D. McLoughlin (0-1). Sub, L. Cawley (0-1). Boston Senior Championships Reaching Critical Stage. With 5 games played in the senior football championship, a familiar pattern is developing. After 8 games are completed, the top 2 teams are in the semi-finals while the next four are in the playoffs. Aidan McAnespies are setting the pace with an unbeaten record and look sure to secure one of the top 2 places. Donegal, Connemara Gaels, and Wolfe Tones make up the chasing pack for the second semi-final place, with the Blues, Mayo, Christopher’s, and Galway following on their heels looking for one of the quarter final spots. The games are becoming critical, and Saturday’s game between Galway and Mayo has to be seen as a must win for Galway to remain in the hunt. Sunday’s football clash between Shannon Blues and Christopher’s at 2:30 is crucial for both teams. The Blues played below their capabilities last week, while Christopher’s were a little unlucky not to get a result against the Gaels. The senior hurling championship is probably the strongest it has been in the last 4 or 5 years. All four clubs have very strong teams out there, so with each team still with 4 games to play there is plenty of action for hurling fans to savor. This weekend the first round ends. Currently Wexford and Tom’s are top of the table with 3 points each, Tipp are sitting on 2, while Galway are still looking for a win. Galway will get their chance against arch-rivals, Fr. Tom’s, on Saturday. On Sunday Tipp and Wexford cross swords in what should be another great game of hurling. Tir na nOg will have a chance to wrap up the Ladies senior football championship Sunday. A win over the Boston Shamrocks would be the third win in the best of five. The Shamrocks showed a significant improvement in their second outing, but there still is a lot of ground to make up to have a chance of forcing a fourth game in the series.